From Here to There, from The Princeton Architectural Press, is the first book from the The Hand Drawn Map Association. Philadelphia-based artist Kris Harzinski has been collecting hand drawn maps for years. He finds maps dropped in laundromats. 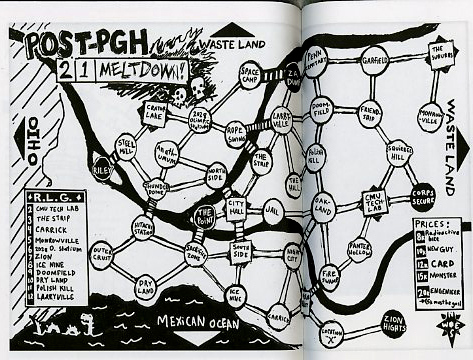 He sets up a table at indy lit events like the upcoming Philadelphia Zine fest and begs strangers to draw maps. Of course, he put out an open call on the internet. He has accumulated hundreds of maps; the variety is quite astounding. In 2008 he founded the Hand Drawn Map Association, or HDMA. Maps vary, but most have a very specific purpose, and it is not always a matter of getting from point A to point B. Take the map of the best places to skateboard in Dallas, Pennsylvania. I found it charming, even though I am not likely to use that information. 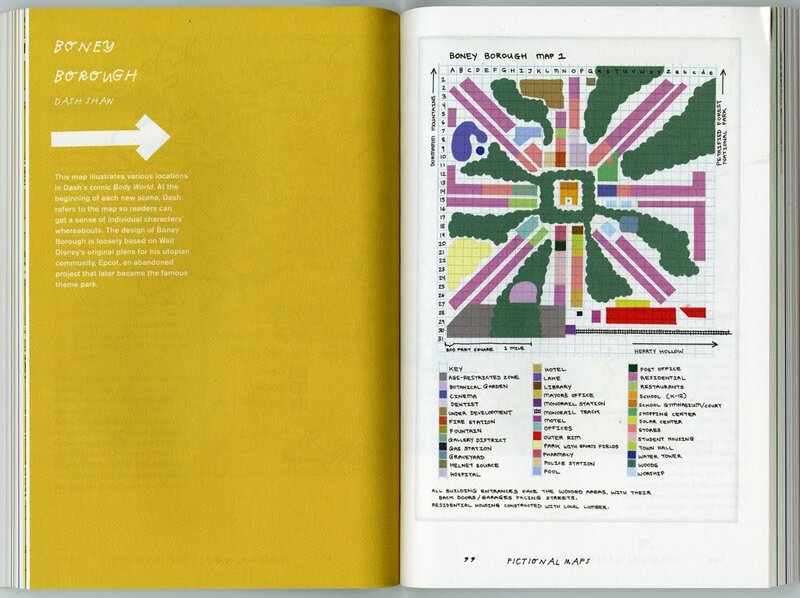 Cartoonist Dash Shaw’s map of Boney Borough, loosely based on the original plans for Epcot, serves as reader’s guide to his Body World comics. Another remarkable entry was by Marilyn Murphy, a young lady suffering from rheumatoid arthritis, who drew a body map of her medical injections. There are maps by Stefan Sagmeister, Daniel McCloskey and Shakes. Full disclosure, I know some of these guys. I got to know Stefan Sagmeister when I drove him home to Manhattan during a blizzard after his talk at Kutztown. Shakes, I’ve met him, too. He is a well-known busker, a street musician, in Pittsburgh’s Strip district. I know Daniel McCloskey best of all, my son, the founder of Pittsburgh’s legendary Cyberpunk Apocalypse Writer’s Cooperative. Map Fans will not want to miss an upcoming exhibition with HMDA maps plus such astounding wonders as Liz Hickok’s Jello-like map of Manhattan, a “Scratch and Sniff” map of New York by Nicola Twilley, and a subway map in Urdu by Pakistani artist Asma Ahmed Shikoh. Next > Heads of State: You Are Invited! Got an Email from Kris Harzinski of MBDA. Turns out he is a pal of KU alum Ryan Smoker of the Infantree, a design studio in Lancaster. He also had work in an exhibition in Sharadin Gallery. We may be able to get Kris to come to Kutztown to do a talk. Will update as details get mapped out.